Since the NHL awards will be given to recipients for the 2012-2013 season on Saturday, I thought that I'd offer some suggestions for awards that the NHL might consider adding to its (in my opinion) incomplete list of accolades. Unfortunately, I came up with the following implausible plaudits after the season had started, so I don't have winners selected for each category. Feel free to suggest a winner in the comments! If there's no feedback, I'll work pay closer attention so that each category has a winner. Where's Waldo Award: A red and white striped jersey will be given to the player who had the least time-on-ice during the playoffs. I chose not to include the regular season because it wouldn't be fair to pick on some unknown player who skated briefly during an obscure shift in some unimportant and easily-forgotten game. The heightened exposure of the playoffs puts extra scrutiny on players, so it's fair to point out which ones vying for the cup took to the ice the least. This year's winner is the Ottawa Senators' Patrick Wiercioch, who logged 1:47 of ice time in his lone playoff appearance in 2013. The Hot-N-Ready Award: The next two awards offer the NHL a new source of revenue: rather than continuing the practice of naming accolades after famous hockey players, the league could sell the naming rights of newly-made awards to corporations. This award is given to the player who has taken the puck away from opponents more than any of his colleagues had. The Groupon Award for Altruism: The polar opposite of the Hot-N-Ready Award, this "prize" is handed to the player with the most giveaways during a season. The recipient will also receive a sack containing one puck for every giveaway he made that year. The Tribute to Whipping Boys: During the award ceremony, a special thanks will be given to the player who sits in the penalty box most often to serve bench minors as well as penalties given to ejected players. 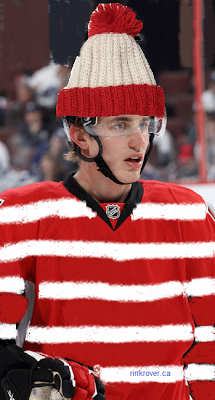 The player worthy of this distinction will be presented with a pair of fuzzy handcuffs. 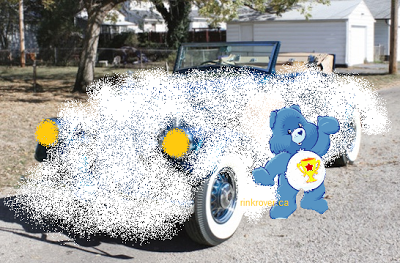 Care Bear Kudo: This honour is given to the player with the fewest hits in the regular season. Like the last person selected in the All-Star Game draft, the winner of this dubious award will be also receive a car. But this isn't just any car; it's a cloud car as seen on the cartoon The Care Bears. If this car's precipitating, don't come instigating. In the event of a tie, the NHL will defer to Shel Silverstein's suggested method of determining a winner: making players fight to the death in a Hug O'War. The Geller Cup: Based on the "troll doll nailed to a 2X4" from the show Friends, the Geller Cup is awarded to the player who shows the most outstanding pettiness in the field of athletic achievement. As I discussed in a previous post, Jonathan Bernier of the LA Kings is this year's recipient. 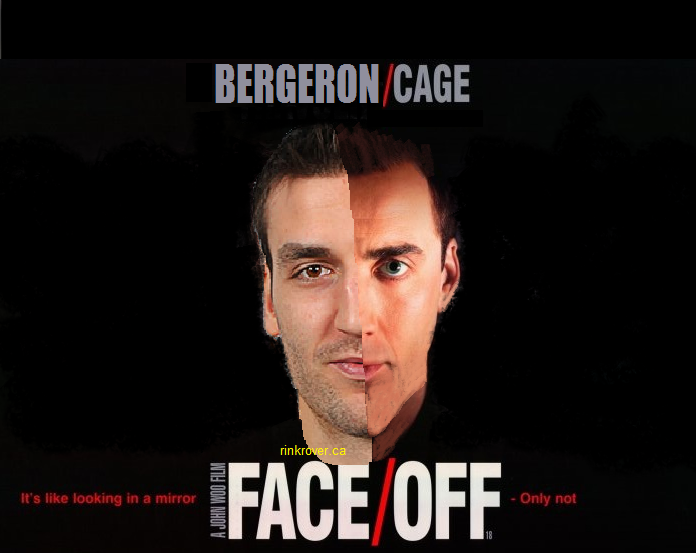 Prize for Most Distinguished Face-Off Winner: The player with the best faceoff winning percentage will be given the opportunity to costar with Nicholas Cage in his latest Hollywood blockbuster. Based on this poster, however, I'm afraid that this year's champion, Patrice Bergeron, and future winners will be stuck remaking Face/Off every year. The Ballast Award: If a player manages to tally zero goals, zero assists, and a +/- rating of zero, he will be given the Ballast Award for his outstanding work in maintaining equilibrium. Unfortunately, due to regulations imposed on the NHL by the United Nations, the player who spent the regular season stuck in neutral will no longer be given a neutron bomb as a gag gift. This had been common practice during that zany, carefree time referred to misleadingly as the Cold War. Instead, the recipient will be gifted with a taupe-coloured shirt with the word "meh" written on it in an understated manner. Sean Avery Memorial Award: This award is given annually to the player who (during the regular season or playoffs) made the most regrettable comment about an opposing team. This year's acclaimed winner is Brandon Prust for his "work" during the Montreal Canadiens' playoff series against the Ottawa Senators. The J.R.R. Tolkien Laureates: Two special awards will be handed out immediately following the NHL draft. One will be given to the shortest, and the other to the tallest player drafted that year. Those players will also be given roles as hobbits and trolls respectively in future installments of Peter Jackson's The Hobbit, which will be released periodically over the remainder of this century. 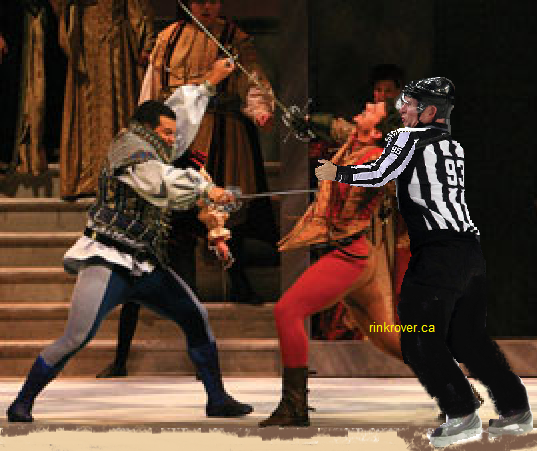 Tybalt Trophy: "Tybalting" occurs when a person wins a fight because an official trying to break up the altercation prevents an opponent from defending himself. I derive this term from Shakespeare's Romeo and Juliet in which Romeo's attempt to stop a duel results in helping Tybalt kill a restrained Mercutio. This award goes to the NHL player who won the most fights while his opponent was unable to fight back. This is basically the only time that an on-ice official will be credited with an assist.